The average length of the great white shark is 4.5 m (15 ft). The female shark has a bigger body than male shark. Great white sharks have a torpedo-shaped body. This shape helps sharks to reduce friction. When you look at their scales, tiny pieces of sharp and rough scales are forming on their skin. They have strong dorsal, pectoral and caudal fins which make it possible to swim up to 24 km/hr (15 mph). They have five gill slits on the side of their body. Their body has countershading. On their ventral part they have white skin and on their dorsal part they have grey. Their snouts have an amazing sense that can sense a drop of blood in 100 liters of water and detect 0.005 microvolts. By using a heat exchange system in their blood vessels, great white sharks can make their body temperature higher than the surrounding water. The great white shark is located at the top of the food chain. The great white shark is carnivorous. They have a broad range of predation. They eat small bony fish to large bony fish. They also eat other sharks. They feed on marine mammals such as seals, and sea birds like cormorants and penguins. We can find great white shark in many oceans that are warm and temperate; water temperature between 12 and 24 degrees C (54 and 75 degrees F). They are usually coastal and offshore waters off the land. Most great white sharks are independent but there are some sharks moving in pairs or in small groups. These sharks can go deep as 1,220 m (4,000 ft), and they can migrate a long distances. The great white shark living in California migrates to Hawaii for at least 100 days. Another example, the great white shark from South Africa swims to northwestern coast of Australia and back, which is 20,000 km (12,000 miles), for less than nine months. Why they migrate and what they do is unknown but researchers are guessing its because of seasonal feeding or mating. They are usually found in the United States (Atlantic Northeast and California), South Africa, Japan, Australia, New Zealand, Chile, and the Mediterranean. 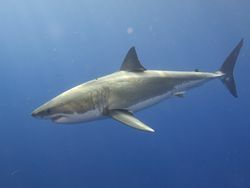 Great white sharks seem abundant because they are in the top of the food chain, but they are rare. IUCN considers them vulnerable because they have low reproductive rates. The most serious problem is occurring by human. Researchers say that the population of great white shark has declined in several area up to 90% for the last 40-100 years. Great white sharks became a target of sports-fishing and hunting. People collect jaws, teeth, bones and mostly everything from the shark. People use shark's liver as a medicine. The trade of shark's fin has increased for the food purposes. ↑ Branstetter, Steven. Carcharodon carcharias(Linnaeus, 1758) ITIS report. Web. Accessed December 14, 2014. ↑ Smith, P.A. Great White shark Animal Fact Guide. Web.August 24, 2014 Date Of Publication. ↑ Long, Douglas. 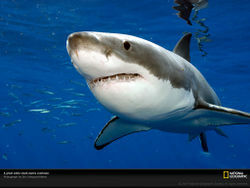 White shark Encyclopedia Britannica. Web.October 12 2014 Date Of Publication. ↑ Fergusson, I., Compagno, L.J.V. & Marks, M. Carcharodon carcharias The IUCN Red List of Threatened Species. Web.December 16 2014 Date Accessed. ↑ Dana, Chewning. Matt, Hall. Great White sharkAnimal Diversity Web. Web. May 30, 2009 Date Of Publication. ↑ Porch,Thomas E. Batdorf,Brad R. Biology with laboratory Exercises. Greenville, South Carolina: BJU PRESS, 2005. 517-518. Print. ↑ Arkive.Carcharodon carcharias Arkive.org. Web.December 16 2014 Date Accessed. ↑ Indianchild. The Great white shark - information & shark trivia Indian Child. Web. January 07 2015-Dateofaccess. ↑ Frech, LeRoy. The Great White Shark and the Marine Eco-System Underwater Photographer. Web.12 September 2008-Dateofpublication. ↑ Arkive.Carcharodon carcharias Arkive.org. Web. December 16 2014 Date Accessed. ↑ Dana,Chewning. Matt,Hall.Great White sharkAnimal Diversity Web. Web. May 30, 2009 Date Of Publication. ↑ whitesharktrust.News Flash whitesharktrust. Web. December 29 2014 Date Accessed. ↑ David.Description of Carcharodon carcharias Encyclopedia of Life. Web.December 16 2014 Date Accessed. This page was last modified on 7 January 2016, at 14:33.